Mountain peaks, hilltops and ridge walks have obvious appeal to walkers – an appeal reflected in the Car Free Walks portfolio. 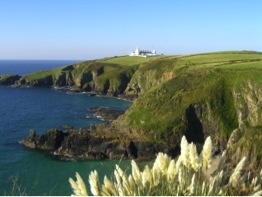 But it was no surprise that the recent top pick of featured walks was in fact a coastalpath. And yet, among the many routes on the website, that giant of National Trails, the South West Coast Path (SWCP), barely figures at all. This is surprising in view of its 1000km of exceptionally varied and dramatic scenery. Maybe the walks are less known because of their seeming remoteness? Land’s End is further than the Lake District from most parts of southern England. Or is it that people expect poor network connections? In fact, the public transport here is as good as other parts of rural England; since the entire South West peninsula is a major holiday destination, bus services are often better than you might expect. So some of the best and most varied walking in the UK is to be found on the SWCP and is surprisingly accessible without a car. Take, for example, the sections of the National Trail around the Lizard peninsula. This is not the most rugged part of the SWCP (think the towering sea cliffs in Exmoor National Park), nor the most isolated (near Zennor, there is a 22km stretch that has no villages). But it is dramatic, scenic and tranquil, all at the same time, and stuffed with nature and interesting sites. We started at Cudden Point, from where you can see the entire coast round to Lizard Point, around 25km away. Our first day was just 11 km, though, to Praa Sands via a gentle 300m climb. The next stage was more undulating, interrupted by a beach walk along the sand bar separating the sea from The Loe, a fascinating inland freshwater lake with masses of wildlife. After 20km – and much more ascent and descent – we reached the pretty village of Mullion, with its almost fjord-like harbour at Mullion Cove. The third stage, beyond Mullion Island, took us through a nature reserve packed with kittiwakes and guillemots. 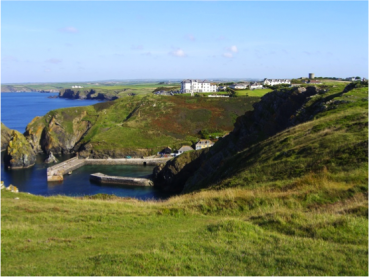 This stage is equally strenuous, with steep climbs and descents into tiny deserted bays like Soap Cove, and a stepped stage down into the more popular Kynance Cove, with its National Trust property complete with a solar powered café. Further on was Lizard Point, the most southerly tip of mainland England. This has a fascinating lighthouse complex and just beyond, the Housel Bay Hotel, right on the path. (It’s a fair cop; I hate camping). On the next day we covered a further 17km and climbed 500m on our way to Coverack, alternating between stony paths and slipping on the polished serpentine, which is still quarried in the area. 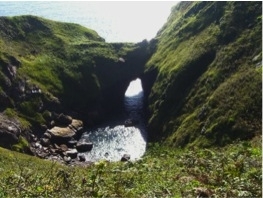 This stage takes in a collapsed sea cave, the Devil’s Frying Pan, and the unfeasibly picturesque village of Cadgwith. We even managed to spot a couple of choughs on route, their red beaks and swooping flight around the cliff-tops confirming this iconic Cornish bird. The descent into Coverack takes you through a sculpture park, hiding decorously within a wooded area. The final Lizard section is long, around 20km to Helford, taking in the mid-point SWCP marker at Porthallow - lots more cliff walking from here and, after Nare Point, a descent towards two estuaries. Gillan Creek is an incredibly peaceful spot, with stepping stones stretching 100m or more across the river mouth. At high tide the stones are covered and it’s a further 3km around the creek to reach the tiny gem of St. Anthony in Meneage. 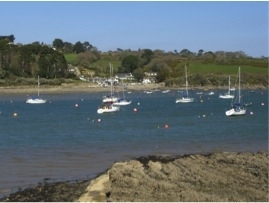 The path is mainly in woods as far as the estuary at Helford, which has a pub, a teashop – and a ferry. The 10-minute crossing to Helford Passage (and another pub) signalled our exit from the peninsula. A steep walk up from the ferry brought to a bus stop with fairly frequent connections to Falmouth, and then onwards, away from the choughs and back into the big bustling world. If you don’t live on the peninsula, the Lizard walks aren’t going to be day trips. Unless you are camping, you’ll need accommodation. There’s plenty, but it tends to cluster in separated villages, so start planning well in advance. You will be moving from place to place and may need to avoid high summer, as many B&Bs don’t accept single night bookings. But spring, early summer and autumn provide the best weather and most colourful scenery, so it’s not a serious restriction. If you are travelling from around London, the overnight sleeper from Paddington gets you to deepest Cornwall after a restful night (OK, sleeper trains are like Marmite), arriving in Penzance at around 8.00am. 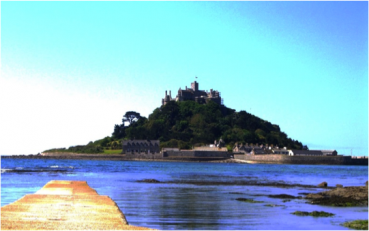 Catch a bus from the station to Marazion, close to the photogenic St. Michaels Mount (not strictly within the peninsula). You can cross the causeway or take a boat if you have time before the real walk begins.